Amita Kanekar, an architecture historian who teaches at the Goa College of Architecture, is also known for her historical novel Spoke in the Wheel. The novel deals with the Buddha and early Buddhism. Raised as an atheist, her interest in Buddhism is far from a spiritual search but an exercise in unveiling revolutionary movements and their implications. 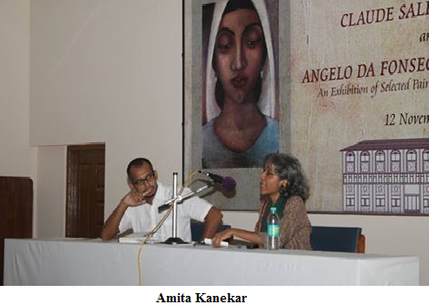 Amita Kanekar elucidated her topic, Buddhism: The Beginning, at Xavier Centre for Historical Research. Citing her sources as Romila Thappar, Nalin Swaris, BR Ambedkar, Debiprasad Chathopadhya, Uma Chavravati and others, Kanekar admitted to relying on secondary sources as she is not a scholar of Pali, which would enable her to translate primary sources. This period saw the beginning of the rise of the modern state in the subcontinent. Prior to the Iron Age, the region was fragmented under tribal rule. These tribes were at different levels of political development and in texts you find them referred to as ganasanghas or tribal republics. They are also called ganarajyas as they move towards becoming states. The socio-political transformation brought about by the Iron Age resulted in the formation of janapadas and then the mahajanapadas that are states created on the basis of land instead of kinship and blood as with the ganasanghas. ‘The Buddha does not belong to a kingdom. He belongs to the Shakyas and the Shakyas are not a place or a kingdom but a ganasangha or a tribal republic,’ explains Ms Kanekar. Later, of course, the Buddha went to Magadha which is a place – a janapada. This shows the evolution of the state during his lifetime. The rise and expansion of the state caused the collapse of the ganasanghas. In fact, the Shakyas had effectively lost their independence to the Kosalas when the Buddha was born. Numerous ganasanghas fell at this time. The political change brought about the migration, enslavement and annihilation of numerous populations. Cities emerged as hubs of political and economic activity that housed a complex society no longer bound by kinship. The cities had their share of prosperous citizens and simultaneously encompassed refugees from decimated ganasanghas. ‘If you read the Pali scriptures they talk about carriages. They talk about gold and silver, about precious stones, people with stables of horses, people with palaces and palaces on the water. Of course, they may be exaggerating, but they do talk markedly of wealth,’ says Ms Kanekar. Nonetheless, the trauma and loss that accompanied this financial upheaval, raised questions about life, the future and about existence. From the embers of the razed traditional socio-political rose a multitude of philosophies. Buddhism was one of them. These included the Darshana (orthodox) philosophies and Shamana (unorthodox) philosophies. The Darshanas were closer to Brahmanical ideas. During this age the Brahmins were a dominant force, which they attributed to their birth and their knowledge of the all-important Vedas. It was a hierarchical society where the Darshanas upheld Vedic ideas but had other elements as well. For example, the Upanishads, which are part of the Vedanta, subscribe to the concepts Brahma and atma, but emphasise the significance of the Vedas and that the identification of the connection of the soul (atma) with the universal soul (Brahma) is the next step. The Darshana philosophies were mainly led by Brahmins and the Shamana by those below them in the caste (varna) hierarchy. There was the Ajivika which propagated fatalism, where nothing positive or negative a person did really mattered since all life was assigned a predestined pattern. It had a considerable following led by Makkhali Gosala. Lokayata, guided by Ajita Kesakambali, advocated materialism and ridiculed the precepts of the Brahmans. Jainavada preached ascetism and was codified by its 24th Tirthankara, Mahavira. Buddhism was one of the new Shamana philosophies and was characterised by the notion of causation: understanding that there are causes. The Shamana philosophies attracted large numbers because of their denouncement of Brahmanical ideology and adherence to equality among all men. The Buddha was born in Lumbini somewhere in the 6th or late 5th century BCE and left home at the age of 29. Acquiring a wealth of knowledge under various philosophers, he finally achieved nirvana (enlightenment) at Bodh Gaya following his austerities. He founded a sangha (Buddhist monastic community), and bhikkhus and bhikkhunis (Buddhist monks and nuns). He began his public speaking, imparting the Dhamma to commoners and kings alike. He lived the life of a nomad until his death at the age of 80. Pali scriptures tell us that the earliest tradition of Buddhism called Theravada consists of the three Pitakas or Tripitaka (Three Baskets). Vinaya Pitaka is all about the sangha, the conduct and discipline to be maintained by people. The Sutta Pitaka comprises of the discourses of the Buddha and prominent members of the sangha. Abhidamma Pitaka contains philosophy and has been found to be older than the Sutta and Vinaya Pittaka. The core message is the Four Noble Truths: the world is full of sorrow, the sorrow has causes, if we understand these causes we can be free of sorrows and there is a way to be free of sorrow. ‘This way is the Middle Way which is about the rightness of view, thought, speech, action, living, mindfulness, concentration…It is almost like a code,’ says Ms Kanekar. ‘The Buddha is one of the rare philosophers who has one of the most comprehensive philosophies in South Asia. He also had a huge body of practice. It is very unusual. Even among the Greeks,’ continues Ms Kanekar. Ms Kanekar counters the idea that Buddhism had grown from Upanishadic thought or Brahmanical thought; an obfuscation created owing to the view that the Buddha is an avatar of Vishnu and that some forms of Mahayana Buddhism are close to some forms of Hinduism such as Puranic Hinduism and Tantrism. The Buddha staunchly advocated against Brahmanical views. Individualism is one of the radical ideas he proposed. Ms Kanekar says, ‘Buddhism is very strongly individualistic. It is all about you as a person. It’s all about what you do and your personal behaviour, your personal action and the fruits of that action on you.’ One bears the reward or punishment for one’s own actions in this life and must do the needful to extricate himself or herself from the consequences of wrong doing. Nobody else will do it for you. This belief is one of the primary reasons why Buddhism saw the Ajivika philosophy as an opponent with its theory of fatalism. Rationalism, the absence of a god or gods, repudiation of spiritualism, eternality, metaphysics and atma or soul, all form the main components of Buddhism. The Buddha believed that the idea of atma originated from the memory of someone who had passed away. The Buddha was an avid endorser of political change. In politics there were supernatural ideas attached to kingship such as the king was born from the sun. It was assumed that it was divinely ordained. In an earlier time, because kinship and family ties endeavoured to keep property and other things within the family, disputes began. The chaos that ensued could only be quelled by an elected Mahasampada, who eventually became the king due to the corruption in the system. The Buddha spoke of the righteous king who ensured the welfare of his people in every aspect, and this would in turn benefit the revenue of the state. The sangha members, in the early phase, begged for cooked food and leftovers. The implications of the rule of begging in Buddhism hold a great deal of significance because it broke caste rules. Nobody else had started a formal organisation such as the sangha, with rules and structure. The sangha was based on original ganasangha concepts but they were open to all castes and women. However, women were still subservient to men in the sanghas. The Buddha himself was originally against the inclusion of women, which reveals his patriarchal leanings. There are verses contained in the Therigatha which were written by the theris or female teachers among the Buddhist nuns. In these verses they talk about how embracing the monastic life gave them freedom from oppression within their families. These theris were a challenge to the conventional view of a woman, staying within the four walls of her home, bearing and raising children, and being dominated by her husband. Property was owned in common by the sangha unlike other Shamana groups. The Ajivikas and Jains had no clothes and sandals, and moved around with matted hair as they could not even own a comb. The Buddha was against these deprivations. The members of the sangha had to wear clothes and sandals because they needed to walk from place to place to beg for food. They also needed a bowl to eat food as it signified civilisation. The other groups derided them for this. Democracy prevailed in the sanghas though later the bhikkhus had an upper hand over the bhikkhunis. This democracy is evident through the Buddha’s decision of not including women being overruled. The Vinaya Pitaka was given prominence over the discourses because it upheld democratic ideas. The members of the sanghas had to meet once in 14 days, then after a month and after 6 months. Meeting after 14 days was very important and those who absented themselves could vote by proxy. Each member functioned according to his or her ability and the aged and sick were looked after by the rest of the members. Ambedkar felt Buddhism was about understanding and love while Iqbal Singh makes a point about early Buddhism being a philosophy rather than a religion because it does not have a goal. One follows Dhamma because it is the right thing to do. Buddhism flourished and was transformed under kings like Ashoka till about the 13 century CE and began to decline with a shift in the polity, economy of kingdoms as large empires gave way to village economies. Some kings such as the Cholas deliberately supressed Buddhism. It was integrated into Vedantic Brahmanism and ultimately became a religion. Its re-emergence is attributed to the British who translated Ashoka’s inscriptions and discovered Buddhism’s anti-caste and progressive nature. 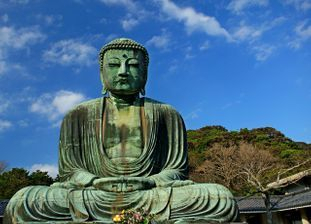 Buddhism is as impressive as a political philosophy today as it was during the time of the Buddha. Its precepts are as practical and valid as they were then and could possibly do a world of good to the country which would seek to apply them.